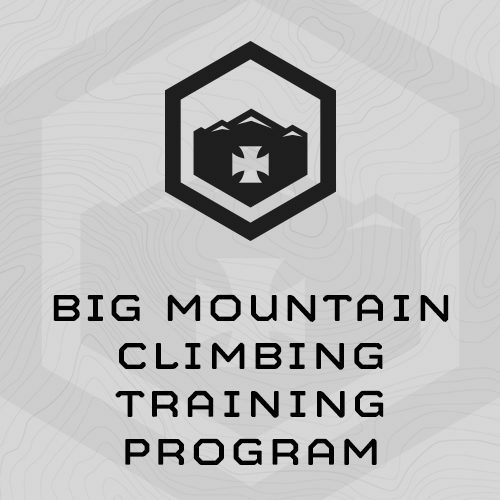 This 10-week training program is designed to prepare athletes for multi-day/week non-technical mountaineering expeditions such as climbing Denali, remote peaks in the Canadian Rockies and big mountains in the Himalaya. You’ll train 5 days/week for a total 50x training sessions. The first 4 weeks of the plan are gym-based and designed to build a base of “mountain chassis” strength. The plan pivots to big mountain endurance and stamina for the final six weeks. (1) Strengthen your legs and lungs for miles and thousands of vertical feet you’ll be hiking up and down during your climbing trip. (2) Build your core/midsection strength and overall strength so your body will be able to perform well with a loaded backpack, and be able to recover from long days in the mountains. (3) Increase your overall durability and injury resistance. The first few weeks of the program has a solid strength and work capacity focus. The goal here is to build your strength – specifically leg and midsection – to increase your durability for the climb and build a solid “base” of work capacity. At week 4, the plan begins to pivot toward climbing – specific strength and endurance. We work on eccentric leg strength for the downhills, and uphill hiking under load via increasing numbers of step ups. Most training sessions are designed to be completed in 60-75 minutes. The Wednesday sessions during the final 6 weeks of the plan, may take up to 120 minutes. For this plan, Training Sessions 1, 6, 11, 16, 21, 26, 31, 36, 41 and 46 are Mondays. This training program is going to be quite an adventure in athletic training for you! Our strength training is built primarily around classic barbell exercises. These are not complicated exercises, but they can be awkward at first. If needed, you can seek exercise instruction from a local coach or personal trainer. You can also teach yourself these exercises by being patient, using lighter loads, and sticking with it. Practice helps! There are many web-based sites and resources to find information on performing these common exercises. You’re not helpless. Be resourceful. Sandbag – During the first 4 weeks of the plan, male athletes will need a 60# sandbag, and female athletes will need a 40# sandbag. During the final 6-weeks of the plan, male athletes will need to increase the weight of their sandbag to 80#, and female athletes will need to increase the weight of their sandbag to 60#. Sandbags can be made from duffle bags, old army gear bags, or purchased through our online store. Use wood pellets or mulch made from ground up tires for fill. Be resourceful. Backpack – During the second 6 weeks of the plan, you’ll be doing thousands of stepups wearing a backpack with weight. Any sturdy backpack or day pack will do. Regular weight room iron plates can be used for weight – but be sure to wrap the plates in a towel before putting them in your pack so they don’t chafe your lower back during step ups. Is the loading different for men and women? Yes – It is indicated in the exercise which load to use for men and which to use for women. 4x Front Squat - increase load each round until 4x is hard, but doable, then immediately …. The dust has settled after another season in the high mountains of Peru. I used the Big Mtn plan and the bodyweight plan for 4 months prior to prep. It was technical climbing at altitude. My work schedule often prevents gym access, so I used the bodyweight plan to supplement when I couldn't get to the gym. I've never felt stronger in the mountains. My regular climbing partner even remarked that he'd never seen me that fit. The only thing I can think of was paying closer attention to my diet that was different than last time I did the Big Mtn. Anyway, thought I'd pass along the kudos. I ripped it this year. Looking forward to ice season now. Finished your program and summited mount Rainier with ease. Great program! I feel the plan met all 3 stated goals. My legs felt strong for the duration of the climb and descent. I barely noticed the weight of my pack at any point. During and after the climb I remained injury free. My quads and hamstring are a bit sore but nothing to complain about. Success on all fronts there. I am curious about what effect, if any, there would be in varying the height of the step-ups in the program. Sometimes you'd do step-ups at the normal height (16"-20") but other times do stepup at a lower height (maybe 10"-14"). The vast majority of my steps on the mountain were not nearly as high as the steps on the stepups. Not a ton of feedback. This plan felt really dialed in for what I needed. Thank you. In preparation for climbing/skiing a technical line on Aconcagua I thought I would try something new for preparation and used your Big Mountain Training Program. While I did supplement the program with long runs (9-14 miles) 4-5 days a week and big weekend outings here in Breckenridge there is no doubt that the program had me in the best climbing shape of my life. All of my mountaineering/skiing/climbing partners have all commented on how much stronger I am. At no point during the entire 2-weeks on the mountain did I feel strength was ever a limiting factor. I completely plan on continuing to utilize the workouts going forward and will use the full program again when it's time to get ready for the next big climb. I recently completed your Big Mountain Training Plan. I trained with the plan in preparation for an international climbing expedition to the Tien Shan Mountains in Kazakhstan and Kyrgyzstan. Our goal was to do an attempt on a 7,000m peak called Khan Tengri. The training plan was an enormous help! Throughout the climb my legs felt strong and well conditioned. The tough mental programing I developed while training allowed me to function confidently, physically and mentally, in hard times such as while climbing in inclement weather. The Tien Shan turned out to be a highly unstable mountain range. Our 4 person team acclimatized well and took advantage of several good weather windows. We were able to summit a 6,090m peak but were unable to summit the Khan due to very bad weather. In any case it was an amazing learning experience. I am totally pumped on your training plans. Thanks again!! I recently finished up the Big Mountain program and I wanted to thank you for making me strong again. I do mountaineering and search and rescue and I am much more effective now confidence wise and physically as well. I tell everyone on my SAR team about your gym and I consider it "my gym" even though I'm in New Mexico. I am employed with the Canadian Forces and am in the sand box right now and have completed your 12 week Big Mountain Training Program. I have been able to give it my full attention, well made time for it and have never been this fit, flexible or satisfied. I have been traing conventionally for 10 years now, along with 1/2 marathons and work up training for two deployments in nine years. Bought the Big Mountain Training Program last year and it changed my fitness and climbing forever. It fixed weaknesses I had in my body for many years from injury or neglect and made me a more complete and better athlete. On Friday - I'll complete the 10 week Big Mountain program. I leave for Denali next week. Thanks for putting together a program like this. It's totally worth every penny. I feel more prepared physically now then any climb I've done before. I also feel really mentally prepared. It took something to complete every workout as it's written. I loved the program and will recommend it to all of my fellow climbing friends. I can't wait to see how all of my hard work will pay off over the coming weeks. I wanted to say that your program is awesome. I honestly can say my legs have never felt this strong before. I am a month and a half out from leaving for Kazakhstan and Kyrgyzstan for a climbing expedition. Your program has helped me to acquire a good deal of confidence. Thanks again for everything! I just got back from climbing 2 volcano peaks 18.4K and 17.1K in Mexico this week and the Big Mountain programming worked great, 2nd time I've used it and it really translates well to the outdoors.